The UK’s bank holiday weekend, for us, was all about the beach. That said, we do try and schedule in at least 2 visits to the beach each week. We tend to work over the weekend as this is the time when the beaches are at their busiest, so it makes sense to structure our week accordingly, and we are not yet tied to normal office hours (heaven forbid!). There are many useful guides around that give listings of things that might be going on over any particular month, and having sampled some of the cultural activities in Granada city itself, we thought we’d take advantage of some of the beachside activities that are a large part of the summer calendar. We earmarked two events for this weekend: a concert on the beach in Salobreña by the band Los Gin Tonic , a local group from Granada, and then a Fiesta at La Barraca, a great restaurant right on the beach at Cantarrijan, a little further along the coast. So, late on the Friday afternoon, we drove down to Playa de Granada, probably the nearest stretch of beach to where we live, and thought we’d relax on the sand before heading off to the concert itself. You may remember, from a previous post, that concerts in the summer tend not to start before 22:00, and this generally means closer to midnight! We have been down to Playa de Granada once or twice, but not really in high season, so it came as a bit of a surprise. There is a built-up area consisting mainly of fairly low-rise apartment blocks, and in the middle of it all there is a golf course, so on the face of it, this is an area that might not appeal to us. That said, we did find a chiringuito out on the western stretch of beach in the spring, so got to have a quick look at what the beach might have in store. This time, we decided to head along to the western stretch where we discovered a rather smart looking Beach Club and a parking space a short walk from the beach itself. As this was a Friday evening, we expected it to be fairly busy and it was, but not horribly so. These beaches tend to be so long that it is relatively easy to find some space without being cheek-by-jowl with other sunbathers. The crowd was mostly Spanish, and that is another surprise to us; in our neck of the woods, we really do not come across many UK visitors. The water was calm - not tremendously exciting from a snorkelling perspective, but it was pleasant enough for swimming. 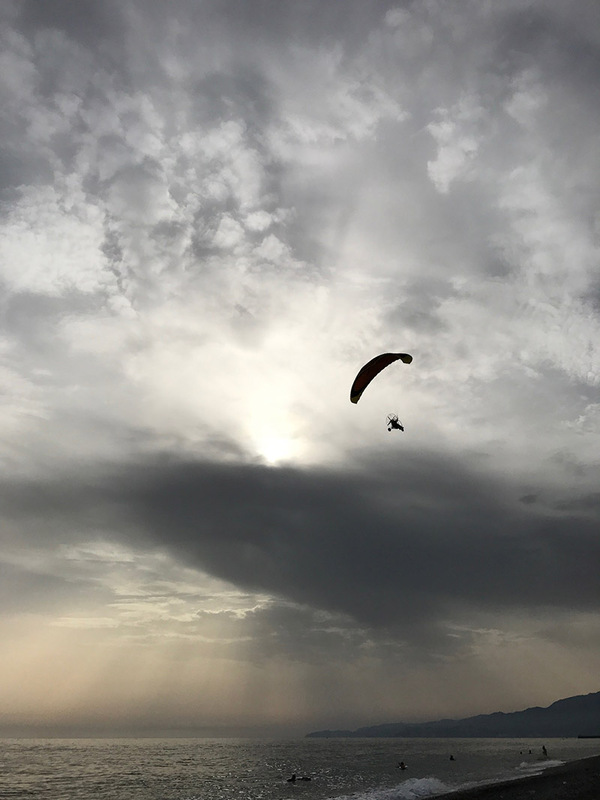 A power-paraglider buzzed overhead and boats whizzed up and down along the coastline, skimming the calm waters. This was a sporty location with a very different vibe from the other beaches we frequent. Thoughts quickly turned to gin, and on our way onto the beach, we passed what looked like a rather nice chiringuito (beach bar) adjacent to the gardens belonging to the swanky Granada Playa Beach Club. At the Beach Club, well-tended lawns stretch down to the beach itself, and these lawns were well covered with sun loungers, set slightly up from the beach giving the impression that the sunning guests were all slightly looking down on the hoi polloi who had no option but to slum it on the sand. The chiringuito had a much more relaxed vibe and, in fact, it was a pretty lovely place to enjoy a drink as the sun went down, and the beautiful light of the late afternoon started to change to a more inky blue of early evening. From here, we went into Salobreña to try and find somewhere to eat that was not necessarily down by the coast. Salobreña is not the easiest town to drive around, as the old part tends to tumble down the hill from the castle at the top, and many of the roads are old and narrow, so the town has implemented a one-way system that is very difficult to follow! Whichever sign we follow, we always seem to end up in this rather small, and hilly carpark from where there is a further steep climb, on foot, to get into the old part of the town itself. Getting out is another story altogether. We did a quick TripAdvisor search and managed to find a restaurant La Traviesa with a great view, not of the sea, but of the mountains looking northwards, and the terrace really did give the best possible panorama. This restaurant has live Flamenco performances every Monday and Wednesday but we had no luck on the evening we were there. Once we’d had dinner, which was very good, we drove down to the beach and found a place to park. We have only ever been to Salobreña beach out of peak season, but it should have come as no surprise to see it so buzzing with activity, and it did rather look a little down at heel. That may be doing the place a disservice, and there was some good flamenco taking place outside the El Peñon Restaurant right on the beach. For my liking, there were too many holidaymakers, and I spend my time trying to avoid the over-populated corners of the costa. However, we were on a bit of a mission: to see Los Gin Tonic. The gig guide that we had studied beforehand advertised that the concert was due to start at 22:00; we arrived at around 22:30 and the bar, Sunem Playa, looked very unbuzzy - one or two couples sat in large white cocktail chairs on the cocktail-style terrace, but there was scant sign of any band apart from a few mics on a stage. We aimlessly wandered onto the beach and across to see a bit of the El Peñon Flamenco display before returning to Sunem Playa to grab a drink. Gradually, other people started to arrive, and we had a splendid time people-watching; eventually, an entry charge was introduced at the gate as the place filled and the band appeared…..and then disappeared. I think they finally started to play at around 23:45 by which time we had to admit defeat. It had been a long day, and we heard a few (very good) songs before heading off home. I wish we had had the stamina to stay, as I think the gig would have been great. The next day, we had another gig, of sorts, lined up. One of our favourite beach bar/restaurants, La Barraca, on Playa de Cantarrijan, had advertised their end-of-season fiesta on the Saturday night, so we reserved a table. During the very busy summer months, Cantarrijan gets very full and so the car park beside the beach is closed, and visitors have to park in a car park just off the N340 road and then catch a shuttle bus down to the beach. The beach car park opens again at around 21:00 so diners can get down to the restaurant for dinner; our table was booked for 22:00. This was a very different affair compared to the previous evening on the beach at Salobreña. Once the sunbathers had disappeared, we had the restaurant, and the beach, to ourselves (apart from other diners). We love this restaurant. The staff are friendly and fun, the food is good, the setting is fantastic. Sadly, there was no record of my reservation, but we were quickly shown to a suitable table that, although we felt that it was initially out of the way, was in an ideal spot. The fiesta was supposed to be a Rock Night, and we were rather sad that we had missed the 80’s and 90’s night of the previous week, but as we neared the end of our dinner, the DJ started to play music. The poor chap was not the most seamless of DJs, cueing up his playlist on his iPhone and hoping for the best, so there was a bit of clunkiness there. That said, the music was right up our street. Someone started to hand out glow-stick wristbands and a Drag Queen made an appearance, flanked by two very good dancers. This might all sound slightly odd, and would not have looked out of place in a far busier resort, but the diners at La Barraca were the only people remaining on the beach, so it all felt rather like a private party for a select group of people. The Drag Queen was great fun, and managed to get people into the party mood; even I got on the dance floor. The atmosphere was fantastic, and it became very easy to feel part of a larger crowd, even if we didn’t all chat; there was a spirit of conviviality and it was so typical of Spain that the people here were of all ages - couples, families, groups of friends, children - and everyone was having a great time. We didn’t like the idea that this party was to mark the end of the ‘season’ as September is still a beautiful month for visits to the beach. The weekend did mark the official end of the Spanish holidays, and on the first weekend of September, everyone returns from their summer boltholes and back to their respective cities ready for work. I hate that sense of an ending, but the party did justice to the season. it was fun, and intimate and we really felt a part of something quite special, in its own small way.